A former associate counsel with Vanguard Group Inc. turned whistleblower has alleged that the investment management company has evaded more than $1 billion in taxes. 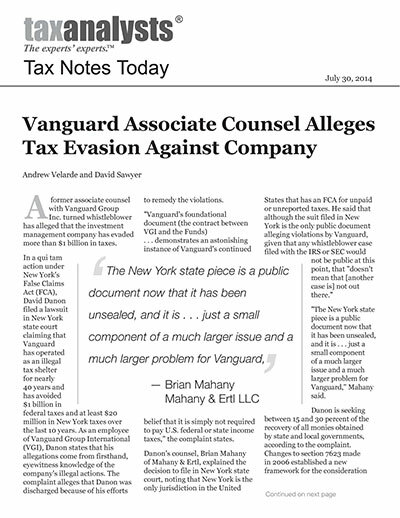 In a qui tam action under New York's False Claims Act (FCA), David Danon filed a lawsuit in New York state court claiming that Vanguard has operated as an illegal tax shelter for nearly 40 years and has avoided $1 billion in federal taxes and at least $20 million in New York taxes over the last 10 years. As an employee of Vanguard Group International (VGI), Danon states that his allegations come from firsthand, eyewitness knowledge of the company's illegal actions. The complaint alleges that Danon was discharged because of his efforts to remedy the violations. "Vanguard's foundational document (the contract between VGI and the Funds) . . . demonstrates an astonishing instance of Vanguard's continued belief that it is simply not required to pay U.S. federal or state income taxes," the complaint states. Danon's counsel, Brian Mahany of Mahany & Ertl, explained the decision to file in New York state court, noting that New York is the only jurisdiction in the United States that has an FCA for unpaid or unreported taxes. He said that although the suit filed in New York is the only public document alleging violations by Vanguard, given that any whistleblower case filed with the IRS or SEC would not be public at this point, that "doesn't mean that [another case is] not out there." "The New York state piece is a public document now that it has been unsealed, and it is . . . just a small component of a much larger issue and a much larger problem for Vanguard," Mahany said. Danon is seeking between 15 and 30 percent of the recovery of all monies obtained by state and local governments, according to the complaint. Changes to section 7623 made in 2006 established a new framework for the consideration of whistleblower submissions and created a new Whistleblower Office within the IRS to administer that framework. If thresholds are met and the information provided. A former associate counsel with Vanguard Group Inc. turned whistleblower has alleged that the investment management company has evaded more than $1 billion in taxes. between 15 and 30 percent of the resulting proceeds. Section 7623(b) also added an option for whistleblowers to appeal Whistleblower Office award determinations to the U.S. Tax Court. responsible for its growth -to its violation of federal and state income tax laws, Danon's complaint alleges. The complaint states that Vanguard violated IRC section 482 and section 211(5) of New York tax law, and that as a result, the company erroneously showed little or no profit for its transactions that involved management of nearly $2 trillion in assets within its commonly controlled U.S. funds that are treated as regulated investment companies. Danon told Tax Analysts that Vanguard's provision of at-cost services was a "black-letter violation of clear and true income principles." "Vanguard and the Funds are explicitly managed jointly in order that '[all benefits accrue to the Funds]' because -- as Vanguard advertises -- 'its interests are 100% aligned with clients' and its 'unique client-ownership structure' avoids 'competing loyalties,'" the complaint states. "In other words, VGI advertises that Vanguard prices are not arms length or market prices due to the common control of Vanguard and the Funds," it alleges. The complaint states that Vanguard adopted the opposite pricing approach for foreign affiliates, treating all other group members as "limited risk" members, entitled to a 7.5 percent cost-plus return. Vanguard thus seeks profit in every jurisdiction in the world other than the United States, the complaint alleges. "One interesting part of it all is that it went on for so long," Danon said, adding that the IRS would normally find and fix a taxpayer's position like the one Vanguard claimed. "In the ordinary case in a controlled party transaction, the taxpayer would have disclosed information sufficient for the IRS or the state tax authority to find it. That did not happen here," he said. The complaint states that Vanguard's tax avoidance scheme is facilitated by the fact that its common control occurs between 150 publicly owned RICs and their management company. Vanguard's mutual ownership structure required the approval of the SEC, which it provided through an exemptive order, according to the complaint. Vanguard has falsely implied that the SEC established the at-cost requirement in the exemptive order, although the order wasn't conditioned on an at-cost requirement, the complaint states. Allegations in the Complaint The complaint also alleges that despite clearly meeting the doing business/nexus standard, which would require the filing of a New York tax return, Vanguard failed to file such returns before 2011. When it did file New York returns, Vanguard filed false returns that ignored the shareholder-based apportionment rule and reported distorted or artificial income, the complaint alleges. It also states that the company knowingly and fraudulently failed to report and pay $500 million of federal income tax and $10 million in New York tax on its contingency reserve. The complaint states that the $1.5 billion contingency reserve, which is classified as a long-term receivable asset on Vanguard's balance sheets, is 1,000 times the size of all payments made for its claimed purpose in the 15 years since the reserve was established. "Vanguard defers reporting and paying tax on the Contingency Reserve Fees because it chooses to defer receipt or invests them in the commonly controlled Funds, in violation of the fundamental income tax principle that income is taxable when 'it is actually or constructively received' or 'is due and payable,'" the complaint states. The complaint goes on to state that in 2003 Vanguard filed Form 8886, "Reportable Transaction Disclosure Statement," when the reserve was only $283 million, but the company no longer files the form and does not include the contingency reserve on the IRS uncertain tax positions schedule. Vanguard failed to report more than $200 million of interest on its contingency reserve as required under section 7872, regarding payment or accrual of interest on loans between a corporation and shareholders, the complaint alleges. In an e-mail to Tax Analysts, a Vanguard spokesperson emphasized that Vanguard adheres to the highest ethical standards in every aspect of its business. "Vanguard operates under a unique mutual structure and has a long history of serving the best interests of its shareholders. We believe that this case is without merit, and we intend to defend the matter vigorously," the spokesperson said. Despite Vanguard's assertions, Mahany said that although his firm did not initially file the complaint, before taking on the matter, his firm vetted the complaint with multiple tax experts who all believed "that it is a solid complaint." New York's FCA Jack Trachtenberg of Reed Smith LLP said that this is the first big corporate income tax case that he has seen brought under New York's FCA. Trachtenberg said that the presence of a retaliation claim was interesting, given that New York has one of the strongest anti-retaliation provisions built into its FCA statute. He said that he thought that this is the first time there has been an anti-retaliation claim in the lawsuit itself. Adam P. Beckerink, also of Reed Smith, said that this is also the first time he has seen conspiracy claims along with criminal claims under the FCA, and that it will be interesting to see how the New York attorney general decides to proceed with the case. The case brings back into focus whether the FCA is appropriate for tax claims, Trachtenberg said. The complaint raises multiple state tax issues, including state corporate income tax nexus, transfer pricing section 482 adjustments, and state tax apportionment. "These are things that the department of finance handles and that we see on audit all the time," Trachtenberg said, adding that to the extent there is alleged criminal activity, there are criminal statutes to address. "This raises the question of why do we have or need this statute, and is it fair given that this taxpayer is now going to be dragged through the press, called a fraud even though this is not really a fraud statute, and have a public proceeding rather than a proceeding protected by taxpayer secrecy," Trachtenberg said. "If any taxpayers thought that Sprint Nextel was a one-off, I think that this indicates that it was not," Trachtenberg said. Beckerink echoed those concerns and said that the use of the FCA for state tax issues raises the risk that a court will determine how to apply state tax law one way even though a tax department already audited that issue and determined a different outcome. Under the federal FCA, there is a tax bar that prevents qui tam suits from being brought based on the Internal Revenue Code; however, the New York statute expressly allows them, Trachtenberg said. Because a plaintiff cannot bring a federal FCA suit over the issue, it makes sense that it is being brought under the New York law, he said, adding that there is an interesting question whether the plaintiff could bring the case in federal court under state law because there is a clear federal question at issue as well. The plaintiff may also have been able to bring a case through the IRS whistleblower program, Trachtenberg said. "For all we know, maybe that is happening as well, given the alleged federal tax liabilities," he said. "Section 482 issues, federally, can be huge numbers; I would think a plaintiff would want the higher reward of pursuing its claim through the IRS whistleblower program," Beckerink said. To the extent that New York has an interest in the claim, that would not help the state recover funds, except to the extent the federal tax liability affects the state tax calculation starting point, Trachtenberg added. "In Illinois, the trend has been that once one FCA case has been let out and you see the state and attorney general's reactions, that basically opened the floodgates to other suits," Beckerink said. "With the way we've seen the New York attorney general go forward in Sprint and maybe after seeing what happens with this case, I would not be shocked if this brings in more cases or if they already have more cases under review that we do not yet know about." It is a little unusual for the taxpayer to bring an FCA claim based on section 482 grounds, Trachtenberg said. "The state false claims act lawsuits we've seen across the country tend to focus very specifically on a specific state tax issue, not a federal tax adjustment that could therefore affect state liability," he said. Addressing what the case means in the larger context of New York FCA litigation, Scott Brian Clark of Dentons noted New York's aggressive stand on pursuing these cases. "High-profile, big-name cases as here will simply add momentum to these efforts," he said.